Most marine vinyl curtains are made from polyvinyl chloride or PVC. People think of PVC as grey or white plumbing pipes – but actually PVC in its natural form is clear. In the marine market, there are four grades of clear vinyl curtains in three thicknesses - 20, 30, and 40 ml: in general, the thicker the vinyl material the greater the clarity. Boat owners are usually not aware of the types of products that you can and cannot use to clean and maintain this specialized vinyl. According to Dan Sarafini for Ameritex Technologies, manufacturers for marine windshield systems – "A lot of people use Rain-X which is really a big no-no as it will dull and damage the external finish. Harsh cleaners such as Simple Green are also something you should never use on your clear vinyl as it will create orange peel. "* Sunscreens also cause serious damage to clear boat curtains – wash your hands thoroughly after applying sunscreen and before handling vinyl enclosures. As PVC reacts with the ultra violet environment the plasticizers migrate out of the vinyl. Plasticizers are what make the PVC flexible and clear. Some vinyl products such as Strataglass have a U.V. protective coating but still need proper care to maintain clarity and pliability. Some boat curtains don’t have any U.V. protective coating and regular maintenance is essential. For salt water, first remove salt water deposits with a salt neutralizer and dry with a chamois or micro fiber towel. 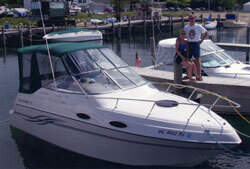 For fresh water, wash with a boat wash and dry with a chamois or micro fiber towel. To prevent deterioration to your boat curtains, it is important to apply a protectant to the inside and outside of clear vinyl. Regularly maintain with this detailing spray, an easy spray on wipe off application. Incorporated polymers in the product protect the vinyl curtains from becoming rigid and cloudy. Storage of vinyl curtain boat enclosures is equally important. Don’t store boat curtains rolled up or folded as it can cause cracking. Don’t store with anything on top, as zippers and life jacket buckles can leave impressions in the vinyl; not only hindering their appearance, but your vision, and depreciating strength. Old white bed sheets laid in between each layer of vinyl enclosures does a great job. Never store boat curtains when they are wet as it can cause them to become cloudy and white. The key to getting a lot of life out of your curtain boat enclosures is to keep the vinyl surface sealed from damaging environmental factors, such as heat, moisture and ultra violet rays.